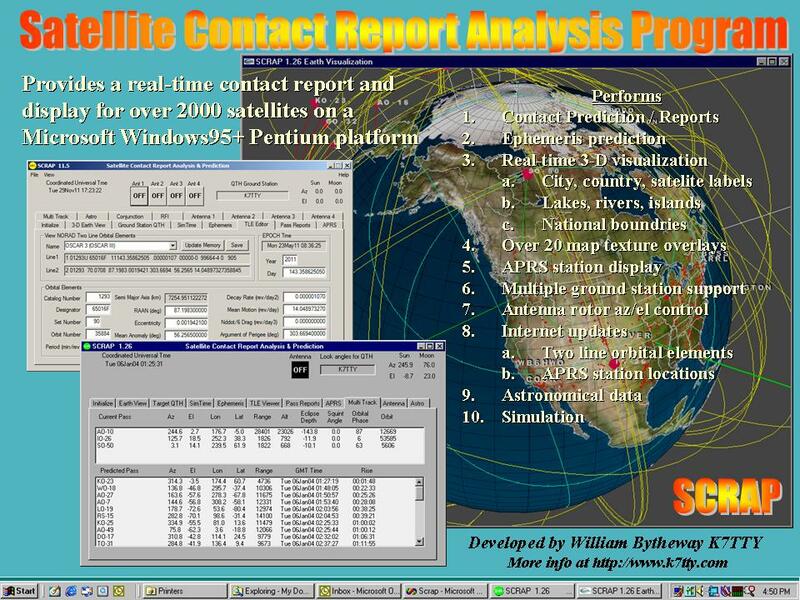 SCRAP 3-D Satellite Display and Analysis Tool - A Windows based 3-D tool used for tracking over 2000 satellites and producing reports. It performs contact reporting, analysis and prediction. SCRAP was developed in the USA specifically for Ham Radio use and not approved for business or commercial applications. SCRAP was first featured in the AMSAT Journal Nov-Dec 2003 and again in Jan-Feb 2006 . AMSAT is not longer distributing SCRAP. The Official Bytheway Software Development (BSDL) Library - A collection of other RTTY tools developed from the BSDL. K7TTY Source Code Ancient Archives - Collection of software specifically written for RTTY and the BAUDOT code. Windows 3.1 TCP/IP Utilities - A collection of Windows 3.1 TCP/IP utilities. Windows 95 TCP/IP Utilities - A collection of Windows 95TCP/IP utilities. BikeMP3 and J&M Corporation sell MP3/WMA USB flash drive players to replace the Honda 6-disk CD changer and allows one to play songs through the headsets with OEM handle bar controls. I installed the J&M player in my 2008 GL1800 in December of that year and started using the software shortly afterwards. I've been extremely pleased with the combination of both products. 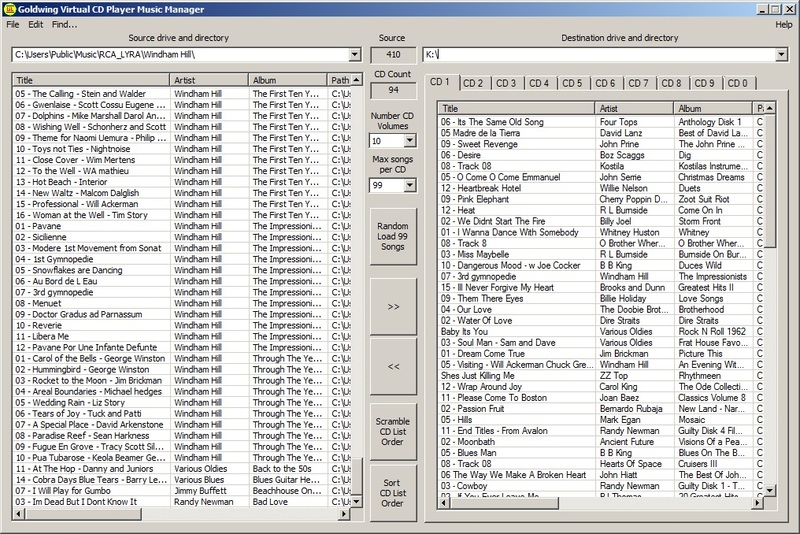 The Virtual CD Changer Software was specifically built for the GL1800 music players to populate and arrange MP3 and WMA songs on your USB flash drive with just few clicks of your mouse. This software is sold exclusively by WingStuff via the Internet. Electronic Project Archive - A collection of 100's of simple to build electronic projects including schematics. RTTY Art Historical Archives - In the 1970's several talented folks created pictures using nothing more than a mechanical teletype machine and punched pager tape. This site supports a JAVA-applet based viewer that lets you view hundreds of these pictures on your PC. RTTYApp Broadcast Software -- Brief introduction to this software application's with links to the evolution over the last decade. RTTY Historical Archives - Collection of historical articles and documents from the K7TTY Archives. Teletype Machines - technical (electrical and mechanical) data on a variety of teletype machines like the Model 19, Model 28 and Model 14. Terminal Units - collection of schematics and technical information from older terminal units built from scratch, kits or other manufacturers that are no longer supported. Internet Teletype - ITTY stands for Internet Teletype. With today's streaming audio over the Internet, George, W7TTY has come up with a scheme that allows him to broadcast teletype news over the Internet 24 hours per day, 7 days per week. Copy any of the three independent news feed teletype signals from the internet using your PC. 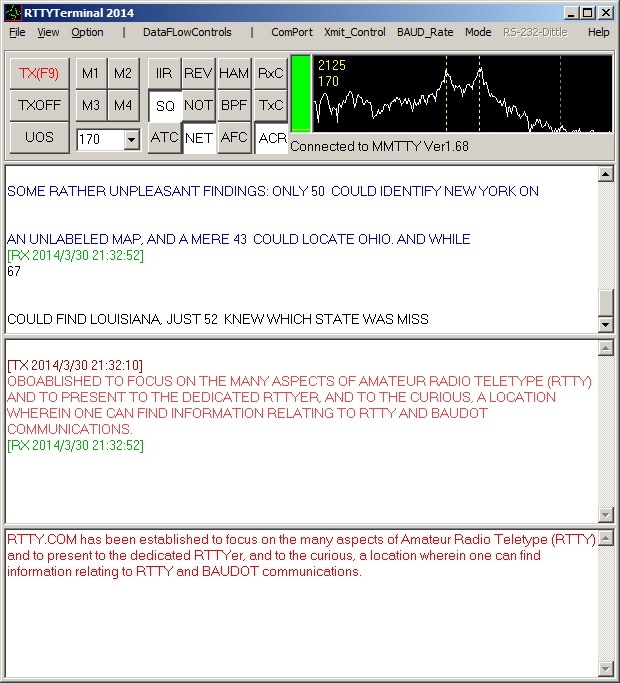 W7TTY is broadcasting teletype news over the Internet 24 hours per day, 7 days per week. With the RTTYMailer you can participate in this exciting ability to bring back radio teletype to your home using basic computer tools and FREE software. This museum (originally known as The Vintage Telephone Equipment Museum) offers a collection of antique telephone, teletype and amateur radio equipment. The address is 7000 East Marginal Way South, Seattle, Washington, 98108. New Release! RTTYTerminal Software New Release! Announcing a new software product for the RTTY enthusiast. It supports both the MMTTY engine and the RS-232 interface so that you can monitor both received inputs in separate text windows. The software can transmit on either MMTTY or RS-232 or both. I can also cross-strap the data feed between MMTTY and the RS-232 ports in either direction making the software act like a repeater. This software uses MMTTY to control the sound card and my own software to access the RS-232 port for the control of a Terminal Unit (TU) similar to the,HAL ST-8000A or ST-6 (modified with RS232). The software supports multiple versions of the BAUDOT code and is capable of interfacing MMTTY to the RS232 port. The first three dropdown menu items File, View and Option control the MMTTY engine and are very similar to MMTTY. For questions on how this works, contact MMTTY documentation. Under DataFlowControls you have the ability to control the sources and destinations of the data. You are allowed to check multiple features at the same time, but for practical purposes, you may only one transmit or receive feature turned on at any one given time. 1. Enable MMTTY TX and TX On/Off allows the MMTTY engine to send transmitted data to the sound card. 2. Enable RS232 TX and TX On/Off allows you to transmit text to the RS232 output. 3. Echo RS232 Received to MMTTY Transmit acts like a repeater sending anything received via the RS232 port to the sound card. 4. Echo MMTTY Received to RS232 Transmit acts like a repeater sending anything received via the sound card to the RS232 port. Use this method if you are using MMTTY to receive data and want to drive your mechanical teletype machine. All products, software and source code developed by and distributed on this site are Copyright (2012) by Bill Bytheway, K7TTY. Written authorization must be received prior to commercial distribution.